Tonight we went out to eat with our friends, the Gillard, for a very unique dining experience. 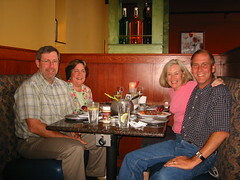 The Tacoma resaurant is called 'the Melting Pot' and the entire meal is cooked at the table. The first course is a cheese fondue with bread and veggies. The second course is a conventional salad choice. The main course is a variety of raw meat and veggies which you cook at your table pot. We had two different beef cuts some chicken, salmon and shrimp. It's a little slow as you have to cook each piece for about two minutes. The final course is fruits and pastries dipped in chocolate fondue. As you can imagine the whole process takes a while. We spent over three hours. It was a unique experience and we always enjoy conversation with the Gillards. Man, you are a dedicated blogger! You stayed up to post this and I could barely keep my eyes open. We enjoyed the restaurant and even more so the conversation. We should dine out again but only this time at an "African" type of restaurant. There is not a better way to get to know a Gillard than to take them to a resturant. I'm Tom's older brother, we visited three years ago, i can't remember if we met you guys or not, but Tom has great friends, I enjoyed your post, Tom took us to some of the same places you went on your trip when we visited. First time I saw a blog, so i was a little scared. How are you? Thanks for the sailboat ride three years ago!